This article is about the art technique. For the album by Malajube, see Trompe-l'oeil (album). For the Westworld episode, see Trompe L'Oeil (Westworld). Perspective theories in the 17th century allowed a more fully integrated approach to architectural illusion, which when used by painters to "open up" the space of a wall or ceiling is known as quadratura. Examples include Pietro da Cortona's Allegory of Divine Providence in the Palazzo Barberini and Andrea Pozzo's Apotheosis of St Ignatius  on the ceiling of the Roman church of Sant'Ignazio. The Mannerist and Baroque style interiors of Jesuit churches in the 16th and 17th century often included such trompe-l'œil ceiling paintings, which optically "open" the ceiling or dome to the heavens with a depiction of Jesus', Mary's, or a saint's ascension or assumption. 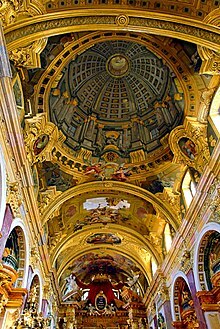 An example of a perfect architectural trompe-l'œil is the illusionistic dome in the Jesuit church, Vienna, by Andrea Pozzo, which is only slightly curved but gives the impression of true architecture. Trompe-l'œil paintings became very popular in Flemish and later in Dutch painting in the 17th century arising from the development of still life painting. The Flemish painter Cornelis Norbertus Gysbrechts created a chantourné painting showing an easel holding a painting. Chantourné literally means 'cutout' and refers to a trompe l'œil representation designed to stand away from a wall. The Dutch painter Samuel Dirksz van Hoogstraten was a master of the trompe-l'œil and theorized on the role of art as the lifelike imitation of nature in his 1678 book, the Introduction to the Academy of Painting, or the Visible World (Inleyding tot de hooge schoole der schilderkonst: anders de zichtbaere werelt, Rotterdam, 1678). In Chicago's Near North Side, Richard Haas used a 16-story 1929 apartment hotel converted into a 1981 apartment building for trompe-l'œil murals in homage to Chicago school architecture. One of the building's sides features the Chicago Board of Trade Building, intended as a reflection of the actual building two miles south. One of France's most illusive trompe-l'œil artists is Jean Claude Adenin, who has created installations for various wealthy clients. Several contemporary artists use chalk on pavement or sidewalk to create trompe-l'œil works, a technique called street painting or "pavement art." These creations last only until washed away, and therefore must be photographed to be preserved. Practitioners of this form include Julian Beever, Edgar Mueller, Leon Keer and Kurt Wenner. 19th-century stained-glass window made for the Henry Gurdon Marquand's mansion in New York. 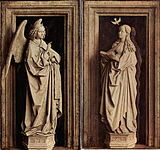 The Annunciation Diptych by Jan van Eyck, detail (c. 1433—1435). Portrait of a Carthusian by Petrus Christus (1446). Note the fly near the bottom. Cornelis Norbertus Gijsbrechts, 1670, The reverse of a framed painting. 19th-century marble bust with apparently transparent veil, Bankfield Museum, Halifax, West Yorkshire. The same bust seen in profile. The effect is consistent from all angles and from close up. A modern Trompe-l'œil mosaic fountain at Brighton, in the form of a carpet thrown over marble steps. Tomb of Rudolf Nureyev draped in a mosaic oriental carpet sculpture. ^ Curl, James Stevens (2006). A Dictionary of Architecture and Landscape Architecture (Paperback) (Second ed.). Oxford University Press. pp. 880 pages. ISBN 0-19-860678-8. ^ van der Vaardt, Jan. "Violin and bow hanging from door" (Painting). Devonshire Collection. Chatsworth House UK: Bridgeman Art Library. Retrieved 15 April 2012. ^ Bateman, Conor (11 June 2015). "A Pigeon Sat on a Branch Reflecting on Existence – An Interview with Cinematographer István Borbás". 4:3. Retrieved 22 July 2015. ^ "The City as Artifact". Chicago Historical Society. Retrieved 2007-08-05. ^ "Mural, Homage to the Chicago School, by Richard Haas, 1980". Chicago Historical Society. Retrieved 2007-08-05. 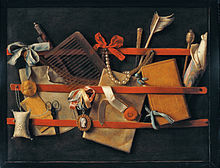 Wikimedia Commons has media related to Trompe l'oeil. This page was last edited on 23 March 2019, at 20:47 (UTC).